Police have arrested three men following a series of incidents in the Lisburn, Moira and Lurgan areas earlier today. Shortly after 11am this morning police received a report of a car being driven erratically in the vicinity of Lady Wallace Forge in Lisburn. Officers from the Auto Crime Team located the blue Toyota Corolla at Sprucefield. The vehicle rammed the police vehicle and made off. The vehicle was pursued by police from Sprucefield to Lisnabilla Road where it collided with barriers at a level crossing which were down to allow a train to pass. The barriers were badly damaged as a result and several train services were delayed while the line was checked. The car was then reported to be travelling through Moira village with extensive damage. Police discovered the vehicle crashed on the Clarehill Road, Moira and the three occupants had made off over fields. 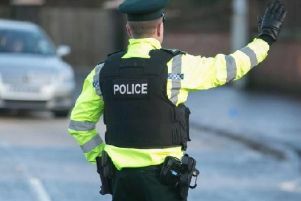 A further report was received that a black Nissan Navarra had been stolen as the result of a burglary a short distance away in Donaghcloney and had been involved in a collision on the Lough Road roundabout in Lurgan. The three occupants were detained by officers from Auto Crime Team with assistance from members of the public, local police, Air Support Unit and colleagues from Operational Support Department. Police thanked the members of the public who reported these incidents and who assisted in detaining the offenders. “It is only by sheer good fortune that there were no serious injuries to members of the public or police officers as a result of this incidents,” said a police spokesperson. The three suspects – aged 31, 32 and 37 – remain in police custody where they are being questioned about a number of reports of thefts and assaults in the Lisburn and Craigavon areas earlier today. Police are appealing for anyone who witnessed any of these incidents to contact officers on 101 quoting reference number 397 of 27/09/17.